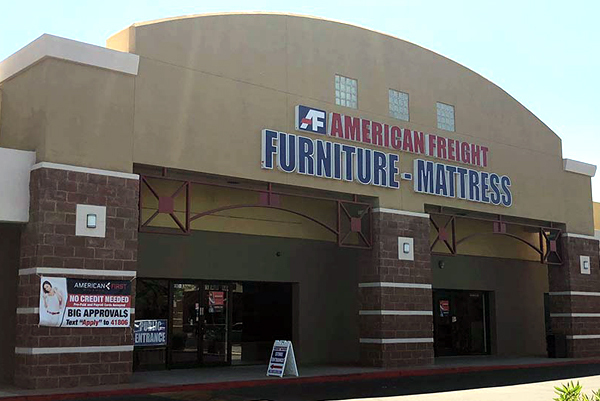 American Freight Furniture and Mattress customers may apply for low, easy payment options through American First Finance. It’s so easy to apply! Stop in to your local store to use the American First Finance kiosk. You could get approved in a matter of minutes. Save time and apply online! Click here and follow the step-by-step application instructions. You can also text “YES” to 41806 to apply right this minute! Once your application is submitted, stop by your local American Freight to shop our living room furniture, bedroom packages, mattresses, and dining sets. Take your furniture home today with a 101- Days Early Payoff Option. Depending on your state, we offer retail installment or lease-to-own products. Service described is a retail installment contract program. The initial payment is $50. All remaining contract payments will be determined by the amount financed for the bill of sale, the APR, the frequency of payments, and the contract term. Subject to approval. For details, visit www.americanfirstfinance.com. Approval is possible without a FICO score, but American First Finance may check credit history. Service described is a lease-to-own program. The processing fee or initial rent payment is $50 plus tax. All remaining payments will be determined by the agreement in accordance with applicable laws and regulations. Subject to approval. For details visit www.americanfirstfinance.com. Approval is possible without a FICO score, but American First Finance may check credit history. The lease-to-own program is not available through American First Finance in Minnesota or New Jersey. Questions or concerns? Call American First Finance toll free at 1-855-721-1188 today.